The first of four meetings between these sides produced a magnificent game, but it was always going to be about how Madrid responded to Barcelona. It’s a shame then that Madrid were brought down to ten men and we didn’t see the fullness of Mounrinho’s second-half tactical shift. Jose deployed a new formation yesterday evening, placing a tight triangle made from two defense midfielders and a center back smack in the middle of Barcelona’s attack. 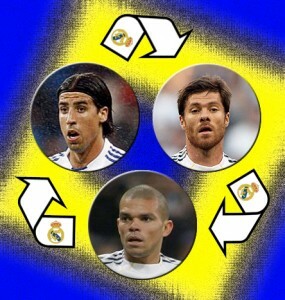 Alonso, Khedira and Pepe–yes, Pepe–rotated defensive and attacking duties amongst themselves, working in tandem to break up the passing game from Iniesta and Xavi, and when they won the ball one of them would spring forward into the attack. Very often it was Pepe, and though it seemed odd at first to see the holding back pushing into the opposing side’s penalty box, it soon became evident that the Portugese was the most dangerous man on the pitch. Barcelona only once pulled their collapse and expand tactic (where they bring three players in attack close together, then one-touch to each other to lure in defenders before turning or passing beyond their now condensed markers) – usually reserved for moments when the defending team are hesitant to leave their defensive zones. This unique moment in the match speaks precisely to the way Madrid disrupted Barça’s usual attack. The visitors were allowed no time on the ball, and almost always forced to move the ball laterally or backwards. Their chances were rare while Madrid attempted to counter through their speedy wingers. There were contentious moments of course. Adriano’s yellow in the 9th minute was very soft, and considering he was tasked with containing Ronaldo he’d have to be careful not to pick up a second. Villa went down in what could have been a penalty, though in replay it did look like he dragged his feet and went over before the Casillas made any bit of contact. But Albiol’s red was certainly justified after dragging down Villa in the box – the end of an odd play actually, as it’s rare to see Barça send a long ball up and over the defense, and the bounce found the Madrid defender out of position. For forty minutes Madrid had to play a man and goal down, and it didn’t seem like they had a chance to come back. But it did feel like Mourinho had planned to lock down the defense before unleashing the team toward the end of the game, and it may have been more a matter of sticking to the game plan than responding to the losing position that caused him to bring on his German playmaker Özil. His addition plus the removal of Alonso for Adebayor injected a bit of danger into the Madrid attack, and even with ten men they started bringing the game to the champions. In the 81st minute Madrid were given a lifeline, and just maybe they deserved it for the effort they put into the game (and for having had a ball cleared off the line and one struck against the post). They certainly deserved it for the foul, though on first look it didn’t seem to have been much – on closer inspection Alves clearly took out the trailing leg of Marcello. Ronaldo converted as Messi had done from the spot at the other end of the pitch, and 10 mintues of subsequent frantic attacking from both sides produced a number of chances that could’ve spelled heartbreak for either side. Now the question remains, how will this game effect the meeting between the sides on Wednesday? Were the choices of players and tactics preferred considered just for this 90 minutes, or were there deeper, longer lasting ploys in effect? We can’t wait to see! Next PostMarca on Madrid: "Con 10 Se Juega Mejor"